We’re a few days early, but Google is about to turn 10 years old this month (they opened their doors in September 1998). 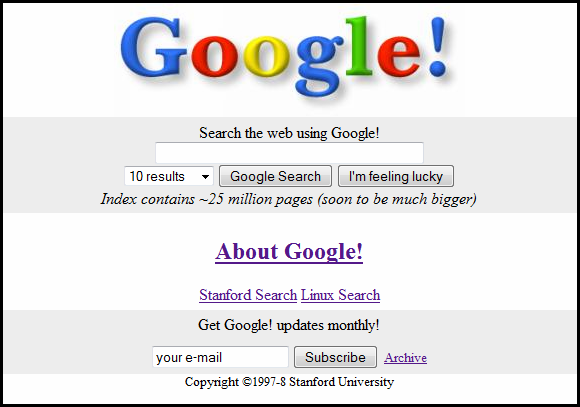 On the Web, a decade is a looong time, so we were curious to see what the Google website looked like when it originally launched. At the time, Google didn’t have much on the actual Google.com domain: Only two links, one to the regular Google version, then hosted at google.stanford.edu and called “Google Search Engine Prototype,” and another to a beta version named “Might-work-some-of-the-time prototype.” The screenshot above is from the google.stanford.edu domain in November 1998. They already had the ”I’m feeling lucky” button in place, but some things were definitely different. We love the comment “Index contains ~25 million pages (soon to be much bigger).” You can say that again. These days, Google’s index contains many billions of pages. That’s awesome. I had totally forgotten about the “!”. 🙂 A little bit like “Yahoo!” isn’t it? I just wanted to drop by and say that your weblog is one of the most entertaining and consistently fun (and informative) feeds in my RSS reader. That’s definitely one of the best “random comments” one can receive. 🙂 Glad you like it!